Scottsdale is a great location for a weekend away with the girls. Think of a day at the spa, followed by happy hour at the pool, foodie-worthy dining in the evening followed by dancing the night away. Scottsdale has something for everyone. One of the reasons Scottsdale was a finalist for our girl’s getaway was because it is an easy flight from just about anywhere in the US. We had members of our gang flying in from various East and West coast cities and we really wanted a direct flight for all. The Phoenix airport is a major hub and has direct flights from most cities. From the Phoenix airport the Scottsdale area is only a 20-minute ride. Uber has a large presence in the Scottsdale-Phoenix area so you should have no problems getting a ride either from the airport or around town. The tricky part about Scottsdale is that it is in the desert and not a place you want to spend your summer. However Scottsdale is in very high demand during the winter months since the climate is so mild. I visited in mid-September and it was still quite hot in the day; but the nights were perfect. We were also a couple of weeks before the main season so our prices were reasonable and nothing was too crowded. Scottsdale is famous for their spa resorts. 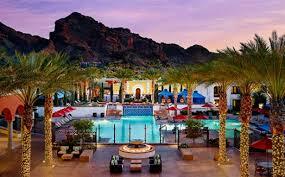 Many of the luxury resorts are located in the Camelback Mountain/Paradise Valley area. This area offers great views of the red rock mountains from most guestrooms, pools and spas. Paradise Valley is about a 20 minute taxi ride to downtown Scottsdale where you will find all the restaurants and nightlife. I stayed at the Camelback Inn by JW Marriott. The resort has an open plan where all the rooms are “casitas.” The casitas are bundled with two or three attached to each other and sprinkled throughout the resort grounds. The resort has a spa onsite, two large pools (one is adults only), and multiple onsite restaurants and bars with both indoor and outdoor seating. The resort hosts live bands and other activities on the weekends. Some other similar resorts in the area to check out are the Montelucia (an Omni property) and the Royal Palms (a Hyatt property.) Both are similar to the Camelback Inn in terms of features and amenities. There are also some spa resorts closer to the downtown area which won’t have the relaxing mountain views but will save you a bit of money. Valley Ho is a cool hotel with a retro theme which is well known in the area. Another good option is the more rustic-style FireSky resort and spa. Dinner: The Mission We went to The Mission for dinner around 9pm on a Friday night and the inside had a great vibe and atmosphere. Patio dining was also available for those looking for a quieter and more intimate scene. Despite having a reservation we had to wait a bit for our table so as a peace offering the host gave us complimentary frozen tequila shooters. The menu could best be described as Mexican tapas. There were lots of small plates to share including miniature tacos which were available with Mahi Mahi, Steak, Short Rib, Chicken and other fillers. Live Music / Lounge: Kazimierz World Wine Bar We started our Saturday night here and it was really the perfect place to set the vibe for a great night out. You will want to make a reservation here. We reserved the couches in front of the stage which was a great experience. The food was good for light bites, we shared a few flatbreads and charcuterie, all of which were great. Of course, being a wine bar they also had a good wine selection to chose from for any budget. The best part of this experience though was the band. They had a great female-led cover band Ferrari playing. They sounded awesome, played great music and were a lot of fun. Dancing: The Mint – This place was interesting to say the least. It is a full on nightclub with youngsters gyrating against poles and a smog machine making the air almost hard to brief. But the music the DJ was playing was great and everyone was dancing and having a good time. We arrived around 11pm and apparently ladies enter for free on Friday nights so we walked right in! By the time we left around 1 a.m. the downtown “entertainment district” was hopping. If you are not sure where to go you really can just show up and look around and you will find a club for you. But be forewarned, after midnight the lines get long and the venues are packed. We wandered into some random sports bar after The Mint and it was full of college aged kids who were all celebrating something or other and were already past drunk. So pick your bars wisely at this point in the evening! Getting around to all the nightlife spots is made very easy by the golf cart taxis that run around town. These are driven by more college kids who are offering “free” rides but suggest a minimum $10 tip. It works out and everyone is buzzing around in these carts in the evening. The one thing we did not have time to arrange was a Party Cycle – one of those group bicycles that everyone in the party sits on and pedals while having drinks. A guide is onboard steering you in the right direction while everyone else hopefully pulls their weight pedaling. I’ve seen these in other towns but Scottsdale seems ideal for this atmosphere. Everyone’s out partying anyway, and unlike some other cities, the roads are flat and in good repair. I haven’t mentioned some of the classic Scottsdale things to do like Golfing, Spa visits and art museums. THat’s all there too and I am sure there are countless guides on what to do in that realm too. But even if you are not into those things, there’s so much dining and nightlife to enjoy you will be happy to sit by the pool the next day.